We recommend that your child have an orthodontic consultation with Drs. Margo Brilliant, Jeff Rothenberg, and Daniel Meister around the age of seven. This exam is especially important for children who may have been thumb suckers or used a pacifier after the age of three, or if you notice obvious teeth, speech or bite issues. Many children will not need early intervention, and many can wait until they are older for orthodontic work. But if your young child has orthodontic problems that should be addressed, early intervention can do more than set the stage for successful orthodontics in the teen years. Talk to our Aventura, FL team about what we can do for your child. 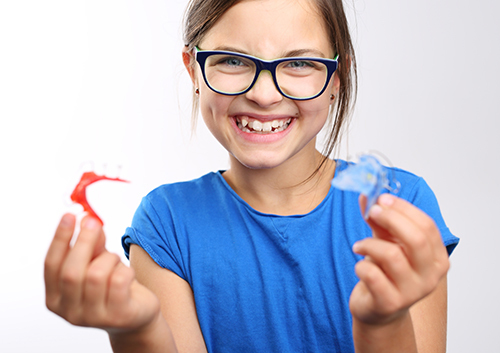 Interceptive orthodontics can protect teeth, guide jaw and speech development, modify harmful oral habits and help to adjust bite problems before they become serious—when it comes to your child’s dental health, the best solutions are early ones!